Autograph Letter Signed, to a Berlin photographer. In German, untranslated. 2 pp. 9 x 6 inches, in good condition. 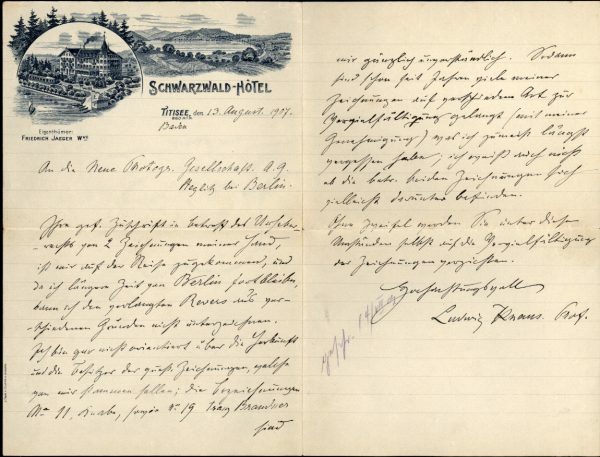 Schwarzwald Hotel, Titisee, Baden, 13 August 1907. Ludwig Knaus (1829-1910) was the most successful Wiesbaden painter in the 19th Century. He gained early fame as a genre painter , as well as a portraitist. He was much in demand from the advertising industry.